Every year, Reporters Without Borders ranks 180 countries in order of how well they safeguard press freedom. This year, the United States suffered a precipitous drop. The latest Press Freedom Index ranked the U.S. 46th. That puts us around the same place as UC Santa Barbara in the U.S. News and World Report college rankings. If we were on the PGA tour we’d be Jonas Blixt of Sweden. If we were on American Idol we’d have been sent home already. Countries that scored better include Romania, South Africa, Ghana, Cyprus, and Botswana. And 40 others. Put simply, it’s an embarrassing result for the country that conceived the First Amendment almost 240 years ago. These rankings are always a bit arbitrary, but we’re not anywhere close to the top tier these days. Why? … the heritage of the 1776 constitution was shaken to its foundations during George W. Bush’s two terms as president by the way journalists were harassed and even imprisoned for refusing to reveal their sources or surrender their files to federal judicial officials. There has been little improvement in practice under Barack Obama. Rather than pursuing journalists, the emphasis has been on going after their sources, but often using the journalist to identify them. No fewer that eight individuals have been charged under the Espionage Act since Obama became president, compared with three during Bush’s two terms. While 2012 was in part the year of WikiLeaks founder Julian Assange, 2013 will be remember for the National Security Agency computer specialist Edward Snowden, who exposed the mass surveillance methods developed by the US intelligence agencies. Some Americans reading those critiques will object that terrorism is a real threat, and insist that national security and freedom of the press must be balanced. Even if you agree in principle, consider the countries that rank highest on the 2014 Press Freedom Index. Here are the top 10: Finland, Netherlands, Norway, Luxembourg, Andorra, Liechtenstein, Denmark, Iceland, New Zealand, and Sweden. Raise your hand if you’re afraid to visit any of those countries. Does anyone truly believe that the way they treat the press is imperiling their security, or that America couldn’t prosper even if it was as friendly to the press as Finland? Does Team Obama believe that the terrorists are going to win in Sweden, New Zealand, and Iceland because their balance is too press-freedom friendly? Take it from Lee Greenwood. “I’m proud to be an American because at least I know I’m freer than 47th-ranked Haiti” just doesn’t have the same exceptionalist ring to it. The index methodology is here. Having looked it over, I still want the U.S. to be on top next year. How about you? The TPP negotiations have been going on for two years under extreme secrecy, no information has been made available to either the press or Congress about the US position. But on June 12, a document was leaked to the watchdog group, Public Citizen, revealing the current US position and the reason for the secrecy. The contents are surreal, shocking and prima facia evidence for how corporations have become the master puppeteers of our government. Despite the North American Free Trade Agreement’s (NAFTA) failures, corporations are arm-twisting the federal government to pursue trade agreements as inevitable and necessary for economic progress. But 26 of the 28 chapters of this agreement have nothing to do with trade. TPP was drafted with the oversight of 600 representatives of multinational corporations, who essentially gave themselves whatever they wanted; the environment, public health, worker safety, further domestic job losses be damned. Residents of the West should be particularly alarmed. TPP would allow the plunder of our natural resources by foreign corporations allowed to bypass US law. Disputes over Western land contracts for mining and timber, for example, would be settled by international tribunals. Even if you are oblivious to environmental concerns, you should be outraged at the total circumvention of national sovereignty. Foreign investors could bypass our legal framework, take any dispute to an international tribunal and pursue compensation for being denied access to our resources at fire-sale prices – with much of the West on fire as we speak. It gets worse. Those tribunals would be staffed by private-sector lawyers that rotate between acting as “judges” and as advocates for the corporations suing the governments. American taxpayers could be forced to pay those corporations virtually unlimited compensation for trying to protect our air, land and water from much looser standards than current US law allows. This agreement could directly affect efforts in my home state of Utah to hold the international mining giant, Rio Tinto, accountable to the Clean Air Act. A consortium of public health and environmental groups including WildEarth Guardians, Utah Physicians for a Healthy Environment, Utah Moms for Clean Air and the Sierra Club have filed suit against Rio Tinto for mining more – and polluting more – than the amount allowed by the Environmental Protection Agency via provisions in the Clean Air Act. This agreement would allow disputes about their pollution to be settled by foreign “judges” who don’t live in Utah, aren’t personally affected by the outcome, aren’t even US citizens and could be attorneys for mining companies. Talk about putting the fox in charge of the chickens. 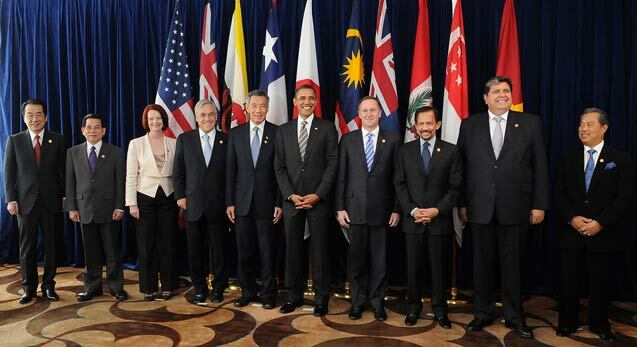 The original TPP nations were the US, Australia, Peru, Malaysia, Vietnam, New Zealand, Chile, Singapore and Brunei Darussalam. But Mexico, China, Japan and Canada are expected to be invited to join, so there is no comfort to be derived from the thought that only a few minor, foreign corporations will be given these extraordinary free passes to profit at our expense. Of course, American corporations will get the same opportunity to “invade” other countries, as if that makes this agreement any less grotesque. TPP is much worse than NAFTA, which eviscerated middle-class jobs and wealth in the US. 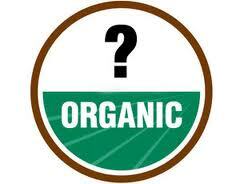 And this sellout to foreign corporations is not just a rogue brain cramp of President Obama. Mitt Romney demanded this agreement be signed months ago, and the notorious “climate change denying” US Chamber of Commerce can’t get it signed fast enough. Romney has called Obama’s the most hostile administration to business in recent history. If the TPP trade agreement is “hostile” to business, god help us if we have an administration, presumably Romney’s, “friendly” to business. If you thought that with Citizens United we had hit rock bottom in surrendering our democracy to the power of money, this TPP “trade agreement” would throw our democracy into free fall. Foreign corporations will be allowed to feast like termites upon America’s natural resources, trash our environment and public health, violate our rights as American citizens and make us pay them if we try to protect ourselves. 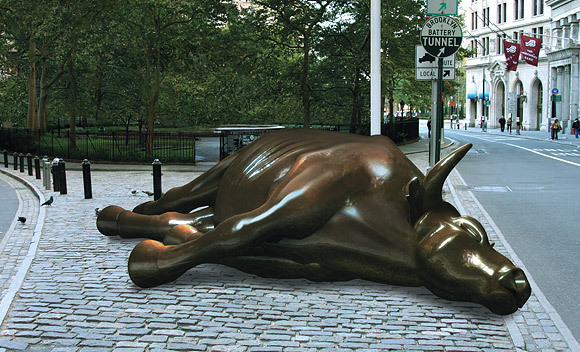 New York’s financial sector has been hit by a further setback – with the prediction that 10,000 people working in the city’s securities industry will lose their jobs. The announcement, forecast for 2012, will mean a staggering 32,000 people in the city’s industry would have lost their jobs since January 2008. But it may come as good news for the Occupy Wall Street movement – which has taken over the city’s Zuccotti Park to protest against corporate greed. The news will pile even further pressure on New York’s battered economy, which is struggling to cope with the fall out from the European debt debacle and turbulence in the financial markets. New York State Comptroller Thomas DiNapoli said in his 2011 statement: ‘The securities industry had a strong start to 2011. ‘But its prospects have cooled considerably for the second half of this year. It now seems likely that profits will fall sharply, job losses will continue, and bonuses will be smaller than last year. He said the securities industry had lost 4,100 jobs in August, wiping out many of the 9,900 job gains between January 2010 and April 2011. According to the report, by the Office of the State Comptroller, securities-related activities accounted for one in eight jobs in the city. It also represented 14 per cent of New York State’s tax revenues and nearly 7 per cent of New York City’s. The report also said that each job gained or lost in the industry leads to the creation or loss of almost two additional jobs in other industries in New York City. 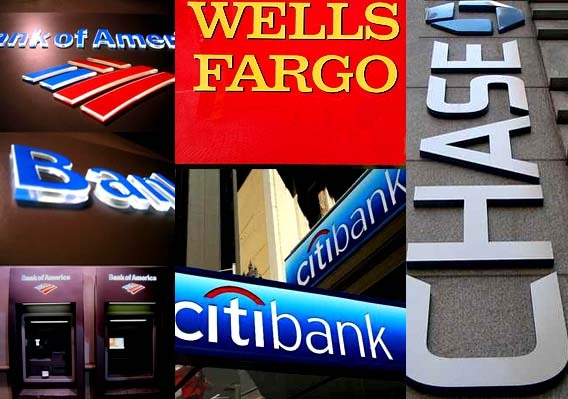 A slew of financial services companies have disclosed plans to cut jobs in recent months, including Goldman Sachs, Bank of America, HSBC and Barclays. Investment banks are forecasted to report big declines in third-quarter earnings in the coming weeks due to big trading losses in the financial markets. 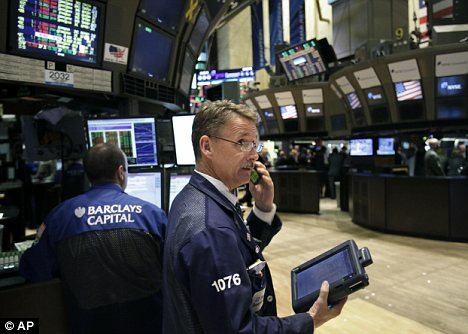 Profits for member firms of the New York Stock Exchange are seen tumbling to $18 billion in 2011, marking a one-third decline from the year before. The OSC said the expected new job cuts are due to the current debt crisis in Europe, the ‘sluggish’ domestic economy, turbulence in the stock markets and regulatory changes aimed at forcing banks to be less risky. Like many analysts, the OSC said cash bonuses are expected to shrink this year, marking the second-straight year of declines. But it is not all bad news. The report revealed the average salary in the industry jumped by 16.1 per cent last year to $361,330. This is in comparison to an average salary of $66,120 in the private sector. The protests against the state of the U.S. political and economic systems, which started with a handful of people, have now spread to more than 25 cities – from Sacramento to Seattle, Anchorage to Atlanta and Mobile to Minneapolis. New York City Mayor Michael Bloomberg said he will allow Occupy Wall Street protesters to stay indefinitely at their Manhattan village – but suggested some have only camped out there because of the warm weather. 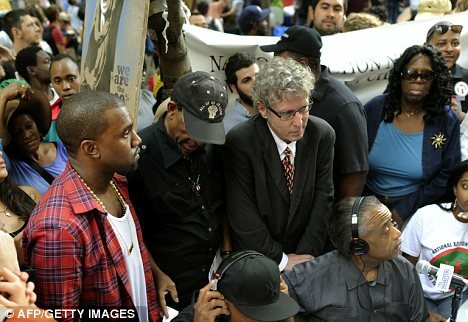 He also said demonstrators will only be allowed to stay in Zuccotti Park as long as they obey the laws. Oldspeak: How bout that. The money will go to more ‘security monitoring software”. The corporatocracy is funding the expansion and strengthening of the police state just in time to literally arrest dissenters protesting its practices; who demand real accountability for precipitating & contributing to the collapse of the global economy. This coming on the heels J.P. Morgan Chase back in March purchasing a 4oo million dollar stake in Twitter Inc. 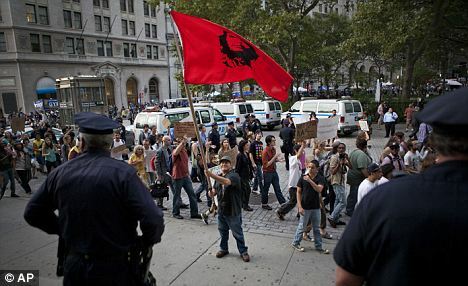 Curiously, there have been reports of censorship of occupy wall street protests by Twitter since then. We are witnessing consolidation of control over security and communications apparatus in this rapidly expanding and insidiously stealthy totalitarian state. The avenues for dissent and resistance are being constricted and cut off ahead of the soon to come collapse. “The Way Forward” indeed. 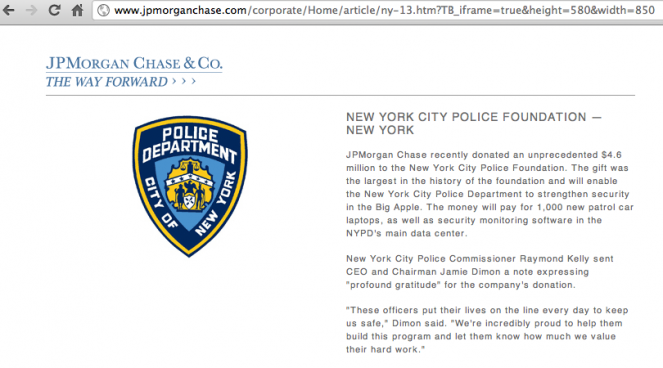 JPMorgan Chase recently donated an unprecedented $4.6 million to the New York City Police Foundation. The gift was the largest in the history of the foundation and will enable the New York City Police Department to strengthen security in the Big Apple. 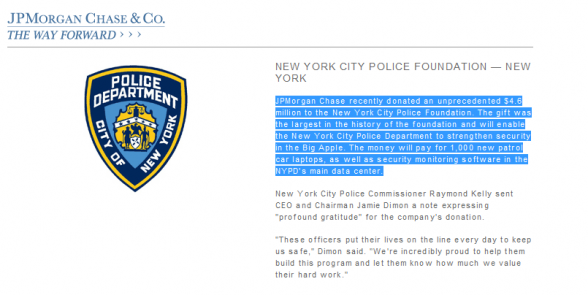 The money will pay for 1,000 new patrol car laptops, as well as security monitoring software in the NYPD’s main data center. Google Inc. (GOOG) is relying on its planned $12.5 billion purchase of Motorola Mobility Holdings Inc. to forestall patent litigation and force settlements with Apple Inc. (AAPL) and Microsoft Corp. (MSFT) over smartphone technology. Google cited patent disputes as key to its agreement to buy Motorola Mobility, announced yesterday. Apple, maker of the iPhone, and Microsoft, developer of Windows Phone software, have targeted phones that run on Google’s best-selling Android system, including handsets built by Motorola Mobility, Samsung Electronics Co. and HTC Corp. (2498), in lawsuits worldwide. Lacking its own trove of patents to vie with Apple, Microsoft and other companies, Google and its hardware partners were targeted by suits aimed at slowing the adoption of Android smartphones. Adding the 17,000 patents of Motorola Mobility, which has been inventing mobile-phone technology since the industry began, may help Google stanch the onslaught. The goal of Google’s new patent clout is also to act as protection for the handset makers that have been bearing the brunt of the litigation, the company said yesterday. Competition for dominance in the smartphone market has heated up since Google introduced Android in 2008. Patents, which grant exclusive rights to use a specific invention, have become a way to fight for market share and inhibit rivals from introducing new features. Apple stepped up the patent feud by suing Android manufacturers, claiming Google-powered devices copy the iPhone and iPad. Microsoft has sued Motorola Mobility and Barnes & Noble Inc., whose Nook reader runs Android software. Apple and Microsoft have focused on the devices that run on Android, while Oracle Corp. (ORCL), which has sued Mountain View, California-based Google directly, contends Android was developed using its Java programming language. Oracle is seeking billions of dollars in damages for patent- and copyright-infringement, and Google’s response has been limited to challenging the validity of Oracle’s patents. Heightening the dispute, a group led by Apple and Microsoft won an auction of patents owned by Nortel Networks Corp. in June after bidding up the price to $4.5 billion, beating out Google in the largest-ever patent auction. Before agreeing to buy Motorola Mobility, Google had few patents on mobile-phone technology. The company’s research had focused largely on its main search-engine business. Google, seeking to tilt the balance, has actively sought patents that it said could be used as a deterrent to litigation, culminating in the purchase of Motorola Mobility. Google bought more than 1,000 patents in July from International Business Machines Corp. The purchase of Motorola Mobility lessens the likelihood of future bidding wars, Ferragu said. Motorola Mobility traces its roots to the 1928 founding of Galvin Manufacturing Corp. in Chicago. The company, renamed Motorola, was a pioneer of early televisions and two-way radio in World War II. It helped lay the foundation for the mobile- phone industry, demonstrating its first handset in 1973. The purchase would directly embroil Google in litigation, where its partners have until now been the main targets. Motorola Mobility has its own pending lawsuits against Apple and Microsoft. A case Microsoft brought against Motorola Mobility is due to begin trial Aug. 22 at the U.S. International Trade Commission in Washington, and a victory may mean a ban on imports of Motorola phones. Motorola Mobility retaliated with a bid to ban U.S. imports of Microsoft’s Xbox video-game systems, with a trial scheduled for October. Motorola Mobility’s case against Cupertino, California- based Apple also was scheduled to begin Aug. 22, though it’s been postponed. 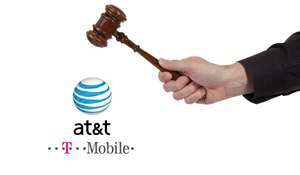 Apple’s case against Motorola begins in September at the ITC. Samsung and HTC also have each filed separate suits against Apple. “We believe we’ll be in a very good position to protect the Android ecosystem for all of the partners,” Google Chief Executive Officer Larry Page said in a conference call with analysts yesterday. Motorola will manage the litigation until the acquisition is completed, expected by the end of this year or early next year, he said. 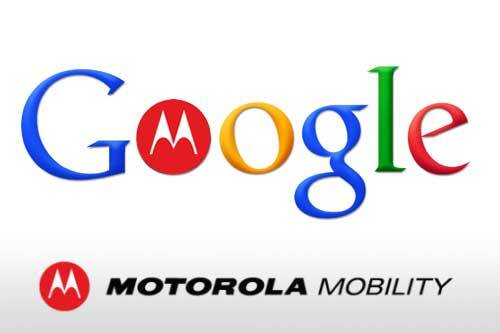 Kevin Kutz, a spokesman for Redmond, Washington-based Microsoft, declined to comment on what Google’s purchase of Motorola Mobility might mean for the litigation. Kristin Huguet, an Apple spokeswoman, also declined to comment. Apple has been winning so far, with an ITC judge’s finding that, if upheld, could lead to a ban on imports of HTC phones into the U.S. and a court order that prevents Samsung from introducing its new Galaxy Tablet in most of the European Union. As yet, nothing has stopped sales of Motorola’s phones or Xoom tablet. Google may be hoping that an agreement can be reached with Apple that mirrors one the computer maker struck with another phone pioneer, Nokia Oyj (NOK1V), said Bernstein’s Ferragu. The Finnish phone maker in June said it won an almost two- year patent dispute with Apple in a settlement that provided it with a one-time payment plus royalties. “From that, you could infer that in the end it’s going to be Apple paying Motorola, paying Google,” Ferragu said. While there will continue to be patent purchases in the mobile-phone market, litigation may slow if Google is successful in its strategy of using patents as leverage to strike settlements and keep further lawsuits at bay. “It may not be the end, but you can see it from here,” said Inflexion Point Strategy’s Laurie. Google “was such an obvious target, and now they’re not,” he said.